From the Hancock County Courthouse, go southwest on Hwy 22 for 7.2 miles to the intersection of Hwy 22 and Main Street in Devereux. Turn right on Main Street and go 0.2 mile to Church Street on the left. Turn left and follow Church Street for 0.3 mile until it merges into Devereux Rd. Go left on Devereux Road and follow it for 0.9 miles to Warren Chapel Road. Turn right on Warren Chapel Road and follow it for 2.7 miles to County Rd 144 and the Warren Chapel Cemetery on your left. Turn left and go 0.8 mile to Glen Harper Road, which is a dirt road to the right. Follow Glen Harper Rd. for 0.7 mile. The graves are about 50 feet off the right side of the road, on a slight rise. 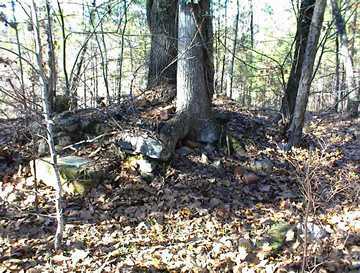 Graves are in a raised brick tomb which has collapsed. A tree has grown out of the tomb. The marker looks as if it may have been added later. Both names are on the same marker, and it is assumed they are married to each other. m. Dec. 23, 1813. On same marker as Susan Heath Bonner, and so marriage to Susan Heath Bonner is assumed. m. Dec. 23, 1813. On same marker as Thomas Clayton, and so marriage and last name to Thomas Clayton is assumed. As many as 25 graves may be in this cemetery as there are many scattered marble stones.